Tata first showed off the Hexa at the 2015 Geneva Auto Show. Then the brand showed what looked like a production-ready version at the 2016 Auto Expo in February and promised a launch soon after. Since then, the launch has been steadily pushed forward, and eight months later we have finally been given a drive experience of the brand's latest flagship. Why has it taken Tata so long? "We wanted to get it right." Can't argue with that! That's not entirely wrong -- nestled in the thoroughly restyled exterior is a similar headlamp shape and side profile to the erstwhile Tata Aria. A glance at the spec sheet shows that it shares the same wheelbase, which reminds that the Hexa is based on an upgraded Aria chassis. Why? Tata needed to get a fresh product out quickly, and developing a new platform from ground up would simply take too much time. Thus, the Hexa. Despite the familiar silhouette, the Hexa is a handsome machine. The new upright bonnet line above the grille is a concept taken from the Land/Range Rovers and adds a lot of character as do the flat surfaces on the top of the new projector headlamps. Big air dams in the bumper housing both daytime running lamps and fog lamps add to the butch theme. 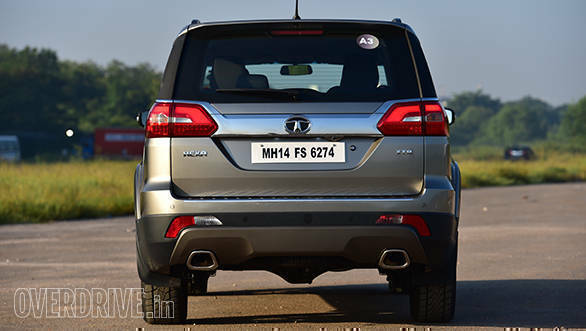 Tata has tastefully injected some character into the side profile with a couple of kinks in the rear window line, and I really like the new tail lamps with those cool LED accent lights. Going with the new design are a set of giant 19-inch wheels, the biggest ever seen on an India-made car! 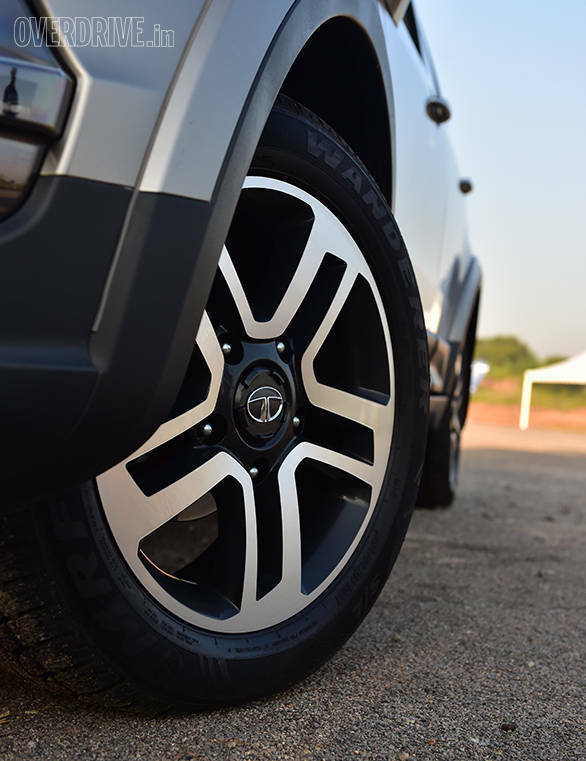 The wheels are wrapped in MRF Wanderer S/L tyres that have been specifically made for the Hexa. While they look great, bear in mind that such large tyres will probably be quite expensive to replace. 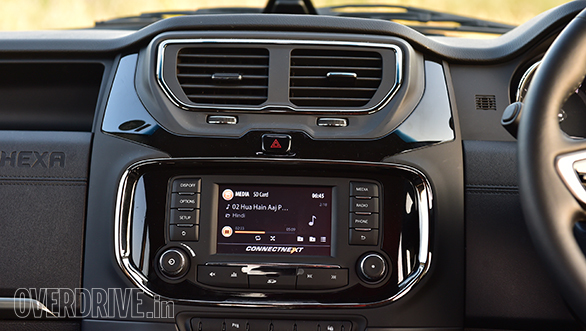 The Hexa sees an even bigger upgrade inside, with a new and premium-looking dashboard that makes generous use of piano black and chrome. Another JLR-inspired theme comes in the faux stitching in the soft touch material that runs across the centre of the dash. Mimicking the stitching in a leather-wrapped dash, the moulding is neatly executed and it doesn't look tacky or out of place. At the centre is a touchscreen system that isn't very high-res but the sound system makes up for it in spades. The JBL system has 10 speakers, and over 1,000 hours were spent in development to perfect the acoustics in this application. The result is a system that isn't simply heavy on the bass, but produces pleasingly clean and crisp sound with balanced sound levels around the cabin. To my ears, this is the best sound system on any sub-Rs 20 lakh vehicle. There are comprehensive smartphone connectivity options and a number of purpose-built apps that can be used with the system. These include navigation, a digital vehicle manual and even a dedicated service app that allows you to view service costs, vehicle status at the workshop and more. 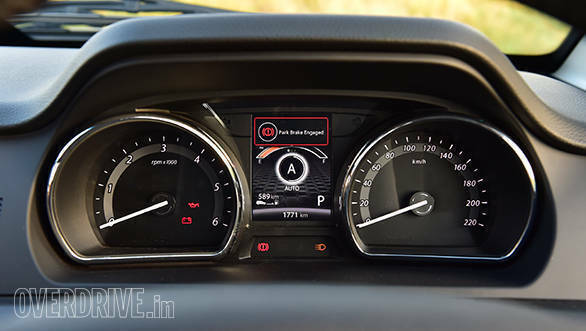 The new instrument cluster has a smart-looking colour multi-information display, and the top model features auto headlamps and wipers. Occupants can choose from eight ambient light colours with customisable intensity, also customisable through an app. There's a cooled glovebox and the rear doors have retractable window blinds. The seats in the Hexa are new and covered in a faux leather upholstery. They're now firmer but far more supportive than the Aria's. The new Tata Hexa offers buyers a choice of two captain seats in the middle row or a 60:40 split folding bench in the middle row. Both options have a sliding adjustment to liberate room for third-row passengers. The third row is also quite comfortable, and even six-foot-tall passengers won't be uncomfortably cramped for knee room. Despite headroom being an issue for said tall passengers, this is still one of the better third rows at the price point. With the third row up, boot space is minimal but the seats fold nearly flat in a 50:50 split to offer ample loading space. 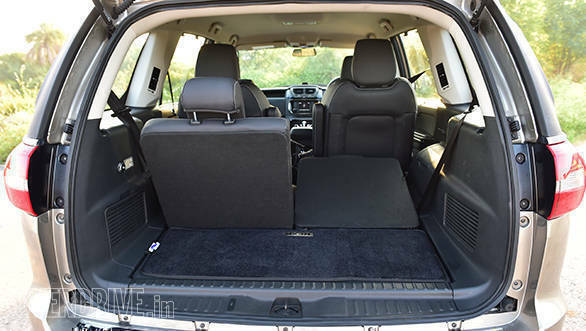 If you opt for models with the middle-row bench, a tumble feature allows further expanded boot space. Strangely, the middle row can't tumble fully forward as it fouls with the newly designed rear console that houses air vents, two flip down cupholders and charging outlets. Tata has paid special attention to connectivity. There are three 12V power sockets and two USB charging ports, with the middle-row port offering a smart charge function that offers optimal charging based on the device connected. The middle row has been designed with separate focus on both passengers. Each gets a reading lamp and has two dedicated air vents. With the Hexa, Tata worked on offering a premium feel through subtle and classy touches instead of gimmicks (the roof-mounted row of stowage spaces is gone). The result is very good but still not perfect. Our concern, once more, lies with longevity. We were given two cars. I spent most of the day with the automatic, and Rohit shot for TV with the manual. My car had done 1,700km while his had clocked just over 4,000km. Fit and finish is vastly improved across the board and while up to the mark in most areas, it is still lacking in a few. The cooled glove box, for example, uses a flimsy feeling clasp and both cars were already showing micro-scratches in the piano black trim. 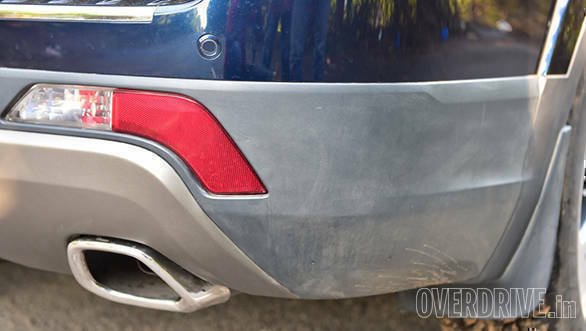 The black cladding on the rear bumper of Rohit's Hexa was already unevenly fading into into an unsightly grey. Then, in the middle of the shoot, the tweeter in the rear left door of the manual Hexa fell out of its socket. I'll give Tata the benefit of the doubt on the tweeter; there's still time to figure out more secure mounting before the January 2017 launch. The early signs of wear in some surfaces though may not be such an easy fix. Tata offers one engine, the Varicor400. This is the same diesel that debuted in the Tata Safari Storme, and it produces the same 156PS and 400Nm. 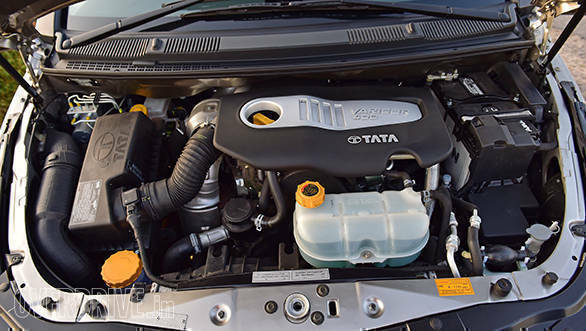 Tata says it has worked on refinement, and the engine is noticeably smoother than the Aria's. The slow-revving diesel still hasn't reached Hyundai levels of refinement, but it's a clear step ahead. Despite the big numbers, this car will not set any acceleration records thanks to the hefty near 2.3-tonne kerb weight on the top-end automatic variant. That said, it is an effortless highway cruiser, reaching 140kmph easily and with enough poke to go even further. However, what really impresses is the new 6-speed automatic gearbox. Being Tata's first automatic, not counting the Zest AMT, the company wisely reached out to a specialist. The 6-speed torque converter from Belgian-brand Punch Powertrain impresses with smooth responses and feels perfectly tuned to the nature of the vehicle. If you want quicker responses, there's a Sport mode that keeps the engine in the right gear and offers as quick responses as anyone could ever need in a vehicle like this. 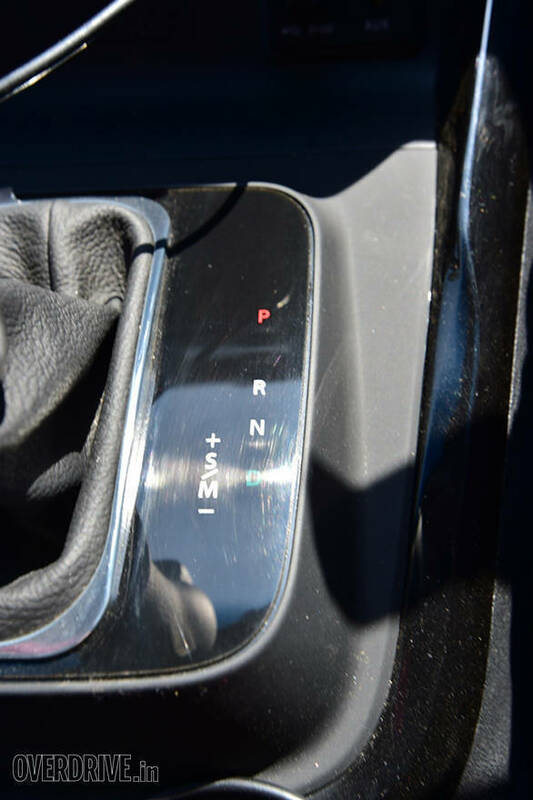 A manual mode is also available for more control off-road. At no point does the gearbox feel cut-price or frustrating and is by far the better driving experience. The 6-speed manual is a familiar unit with its long throws, mildly rubbery feel and tendency to miss shifts if used in a hurry. Clutch action is reasonably light, but the whole driving experience is average compared to the auto. However, the manual offers two big advantages. First, we have been given to believe that the all-wheel drive system will initially be offered only with the manual gearbox. Second, the Super Drive Modes that Tata has been pushing hard in its promotions will also be solely available in the manual. We'll talk more about that in the next section. Certainly. The more refined engine means better NVH in the cabin. Even at highway speeds, engine and road noise are well controlled, with wind noise getting loud only above 130kmph. The Hexa gets new dampers targeted at improving on the Arai's already impressive ride quality. It retains the Aria's Volvo bus-like feel with a lovely isolated ride but considerable side-to side body roll. However, it now handles rough and scarred roads even better and simply sails over poor surfaces; you have to slow down only for deep potholes. Handling is as good as it can get for such a tall, soft and heavy machine. The Hexa feels composed in corners and offers sufficient grip to a point, after which the large front tyres push into understeer. Long sweepers are definitely preferred over tight bends. In the city, the Hexa is an improvement over the Aria thanks to the automatic gearbox, but the heavy hydraulically assisted steering and big turning radius take a bit of work. The Super Drive Modes are inspired by Land Rover's Terrain Response system with four driving modes on offer. They work using the ESP, all-wheel drive and engine response through the ECU. Four modes are on offer - Comfort, Dynamic, Auto and Rough Road. Comfort mode softens engine response for stress-free cruising. Dynamic offers sharper engine responses and relaxes the car's ESP, allowing for later intervention which allows the rear to move around a little bit. Auto mode allows you to simply let the car make the decisions based on driving style and road surface. Rough Road mode is the mode I found most interesting thanks to an off-road course Tata set-up. It aims at maximising torque spread in low traction situations and the difference is tangible. Launch the car hard in gravel and you can feel it bite down and find maximum traction in Rough Road mode. The same goes for driving through deep depressions. The wheels with less grip spin momentarily before torque is redirected to the wheels with most traction. The Hexa has surprising capabilities off-road thanks to the 200mm ground clearance, all-wheel drive, drive modes and ample low-end torque. There's also hill descent control that manages steep descents on broken surfaces at 8kmph, leaving only steering duty to the driver. Absolutely. We can't speak for how well the entry models will be specced just yet, but the top models have a comprehensive safety net. ABS with EBD is standard and the brakes also have a prefill feature - lift off the accelerator suddenly and the hydraulic pressure in the brake lines will be increased to provide stronger braking performance if the driver depresses the brake. This provides harder braking in emergency situations with less pedal effort. Six airbags, ESP with traction control, hill hold and height adjustable seat belts round off the safety package. 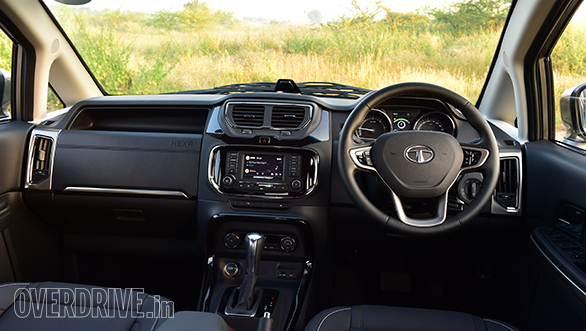 The Hexa is a big improvement over the Aria, big enough to justify Tata's claims of it being a brand-new car. Despite some grey areas (sorry, couldn't help myself there! 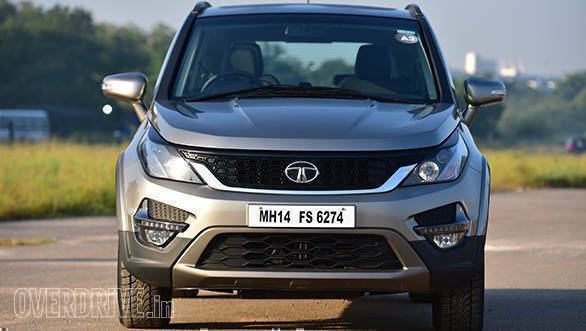 ), build quality is at a new height for the brand, and the maturing design direction shows great promise for how Tata's next-generation vehicles will appear. The features list is comprehensive and the driving experience is quite nice as well. In that sense, while not a revolutionary new product, it is now better equipped to take on competition like the Mahindra XUV500. The big question, of course, is whether it can stand up to the Innova Crysta, which is an absolute beast of a rival. The highly priced Crysta is already a big success, partly as it's an impressive vehicle, but mainly because it was birthed on its predecessor's incredibly strong image for quality, durability and resale value. 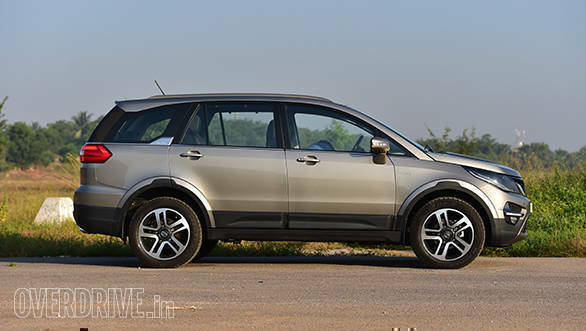 The Tata Hexa ironically carries the brand's baggage for quite opposite qualities. Good pricing at the Jan 2017 launch will be the first step in the Hexa's fortunes. We expect it to be priced between Rs 12-18 lakh, perhaps with a lower entry point if Tata launches a stripped-down model. 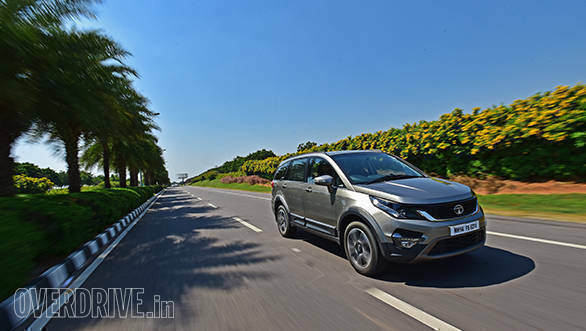 If Tata nails the pricing, the Hexa then has to prove its long-term quality and reliability. This is something the Tiago is already attempting to do, but as with the smaller Tata, only time will tell.